1. GRANT OF LICENSE. The SOFTWARE PRODUCT is licensed as follows: (a) for Individual License Installation and Use. eb_labs grants you the right to install and use copies of the SOFTWARE PRODUCT on your computer running a validly licensed copy of the operating system for which the SOFTWARE PRODUCT was designed [e.g., Windows, Mac OS, Linux]. (b) for Site License Installation and Use. 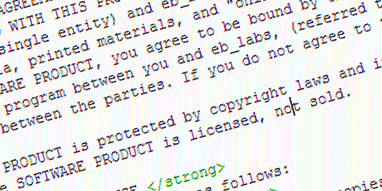 eb_labs grants you the right to install and use copies of the SOFTWARE PRODUCT by all employees of single Licensee’s site on computers running a validly licensed copy of the operating system for which the SOFTWARE PRODUCT was designed [e.g., Windows, Mac OS, Linux]. (c) Multi-Site License Extension. A Multi-Site License Extension can be purchased to extend coverage of a Site License to include usage by employees at multiple physical sites of a Licensee’s company. (d) Backup Copies. You may also make copies of the SOFTWARE PRODUCT as may be necessary for backup and archival purposes. (e) Updates. Updates will be made available free of charge for 1 year from the date of purchase. 2. DESCRIPTION OF OTHER RIGHTS AND LIMITATIONS. (a) Maintenance of Copyright Notices. You must not remove or alter any copyright notices on any and all copies of the SOFTWARE PRODUCT. (b) Distribution.You may not distribute copies of the SOFTWARE PRODUCT to third parties. (c) Rental. You may not rent, lease, or lend the SOFTWARE PRODUCT. (d) Support Services. eb_labs may provide you with support services related to the SOFTWARE PRODUCT (“Support Services”). Any supplemental software code provided to you as part of the Support Services shall be considered part of the SOFTWARE PRODUCT and subject to the terms and conditions of this EULA. (e) Compliance with Applicable Laws. You must comply with all applicable laws regarding use of the SOFTWARE PRODUCT.